If you have ever watched “Marley and Me” then you know the dangers of Bloat (GDV). Gastric Dilatation-Volvulus (GDV), commonly called bloat, is an emergency medical condition that is seen most commonly in large and giant breed dogs. This is a life-threatening situation that occurs when the stomach fills with gas and/or food, expands, and then rotates, trapping gas inside the stomach and cutting off blood supply to the stomach and spleen. As pressure in the stomach builds up and cannot be released, the stomach tissue becomes necrotic (dies) and the stomach can even rupture. The expansion of the stomach also has a serious effect on the heart and lungs, causing difficulty breathing and abnormal heart rhythm. Most dogs will go into shock soon after the signs of GDV are seen. Death can occur within a matter of hours (or less). The Doctors at Town Center Animal Hospital can prevent this terrible disease with a simple procedure that uses minimally invasive techniques. The “old” technique involves a large incision and a severe amount of pain. Our hospital uses scopes and provides minimal pain and quicker recovery. Please call and schedule your procedure today to protect your pet from this life threatening disease. 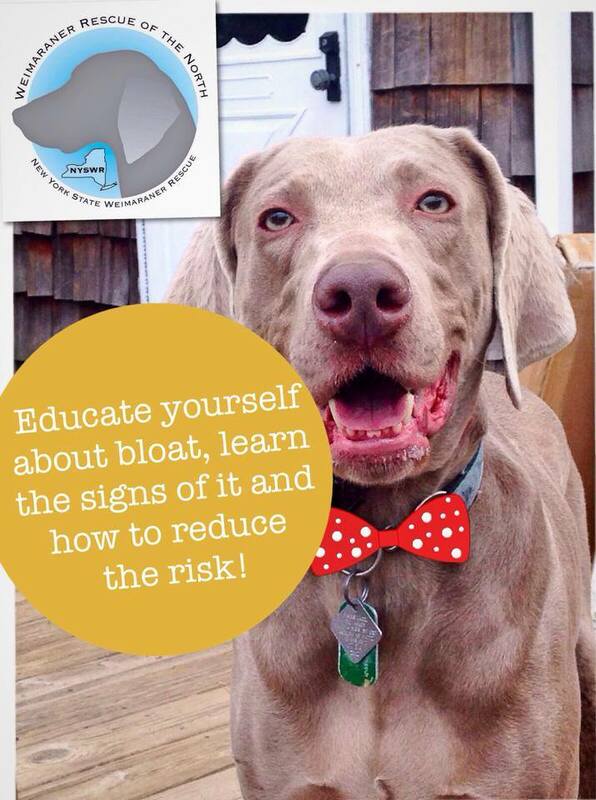 It is so important as a Weimaraner owner to know about bloat. It can kill an otherwise healthy dog in hours. While the exact cause is still unknown, factors significantly associated with an increased risk of GDV are increasing age, having a first-degree relative with a history of GDV, having a faster speed of eating, and having a raised feeding bowl. Approximately 20 and 52% of cases of GDV among the large breed and giant breed dogs, respectively, were attributed to having a raised feed bowl. Thank you so much for your help. There are two different versions. Please use whichever you are able to open on your computer.